You can go to a restaurant for dinner and sometimes entertainment. 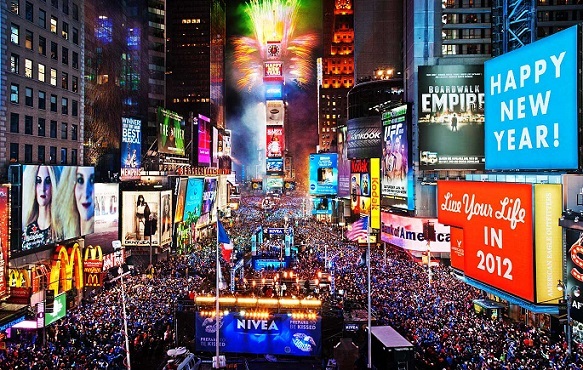 You can go to a public place for a sponsored New Years celebration such as the world famous gathering at Times Square in New York City. Or you can celebrate the passing of one year and the coming of the new year at home. 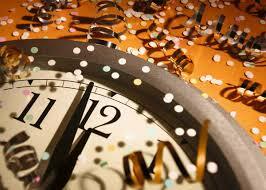 This page addresses staying at home with family and friends on New Year’s Eve. Having a New Year's Eve celebration at home instead of going out is sometimes a matter of convenience, money or children - and often - because home is the best place to be, especially on New Year's Eve. You can make your "stay-at-home" New Years Eve party a memorable evening with these New Year’s Eve recipes, serving suggestions and ideas. For those of you who have read other pages on the website, you know I absolutely love to have family and friends over for food, beverages and socializing. I guess that is how I "accidently" started a restaurant. But the difference between being a restaurant owner and being myself at home is that for home celebrations I really don't invite hundreds of guests. At home, I invite family members and friends, usually a more controllable situation than having a party at the restaurant. There are literally hundreds of ideas for what to do for a party on New Year's -other than "eat, drink and be merry." You could have a "themed party," based on a particular culture or a particular time period (I love doing the 50's or 60's or 70's), or do "movie stars" or other celebrities. Once a theme is selected, the goal is to match the music, attire, decorations and food with those years. On the other hand, no theme for the party can be just as much fun. The real fun comes from the company, the food and beverage, and the graciousness of the host/ess. That's you! You can also simplify the foods available by specifying "appetizers only" or even "desserts only" if your guests are having dinner prior to coming to your party. Or, combine these two foods. The other thing to do when having a crowd over is serve everything buffet-style. This makes the party much more fun for the host/ess. After you greet your guests at the door as they arrive, point them toward the beverage table (a self-service "bar") and let them walk past your wonderfully decorated food table. If your guests are bringing beverages and / or some of the food, take their offerings and place them on the appropriate table. How about you "assign" a friend to help with your New Years Eve Party? As a start, and a finish, to a New Year’s Eve celebration at home, offer good quality champagne (and sparkling cider for non-drinkers). 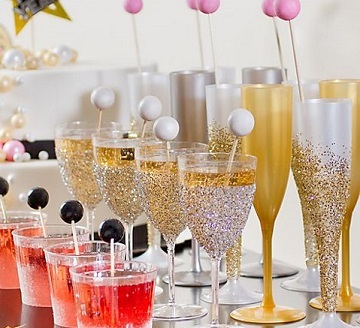 Have champagne glasses (usually flutes - although for a family affair they can be - and probably should be - plastic) half full on the beverage table for your guests to pick up while waiting for the other guests to arrive. Visit a local party store and buy the plastic glassware (plain or fancy). You might also mention that during the evening they should be prepared to make a toast to one of the other guests. This is really great fun ...so long as everyone understands the rules. Serious toasts must of course be loving and kind. Humorous toasts must not invade any sensitivities. Besides a small glass of good champagne, the standard liquors should be available (scotch, bourbon, vodka, gin, rum) and some white and red wine, cold beer and some non-alcoholic beverage choices. Make certain you have ice, some mixers like club soda, tonic water and dry vermouth with some lemons, limes, and olives at the beverage area, as well. You should also have a couple "varieties" of soft drinks on hand and for mixers. Of course, you'll need plenty of plastic glasses, wine glasses, and martini glasses. And be sure to have lots of napkins at the "bar" and strategically located throughout the dining room, living room and kitchen. Important Note: Make sure all your guests have safe transportation home. My friends and family members are all picked up by designated (non-drinking) drivers and are driven home by this same person. (I only have one guest room). Do I always provide all the beverages? No, crazy as I may be ...I'm not totally "gone." When I invite guests, everyone always asks what they can bring - so I tell them. Bring your favorite beverage with the mixer you need. I sometimes "warn" my guests that at some time during the evening we may play a board game (Trivial Pursuit is one of my personal favorites). We choose teams by "lot" and this game propels us toward the next year. Playing a board games with your friends and relatives is usually more fun than simply waiting for "the ball" to drop on TV. "What about food?" "What can I bring?" the invited guests may ask. Sometimes, depending on my own situation, I will ask them to bring something (their 'specialty'). First, if your guests are bringing food items, "fill in the gaps." Are they bring appetizers? What kind? Are they bringing a crock pot item? A dessert? 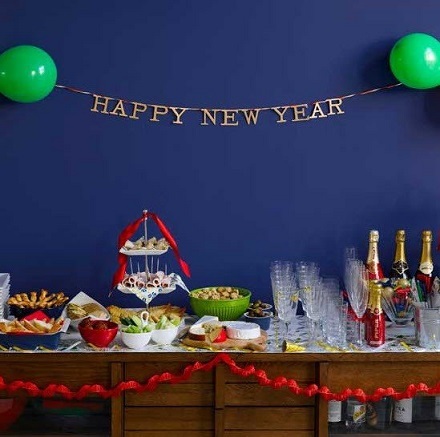 The suggested food ideas listed on this page are for a "non-themed" New Years Eve Party. I also am suggesting you "stagger" the food offerings throughout the party. For a New Years Eve Party at my house, I often have trays for several different kinds of olives, 3-5 cheeses - hard and soft, some artisan crackers and thin-sliced baguettes in a basket with butter and special mustard nearby, a tray of ham and salami, some wild salmon and some almonds or walnuts. If you're "brave" - even popcorn is okay. About half way through the New Years Eve Party (or as the food table starts looking well-used) I add a salad of romaine, red onion, artichoke hearts, cherry tomatoes and thin-sliced yellow and red pepper. I also bring out some skewered Steak Strips with a small dish of horseradish sauce. And I usually present some prawns with cocktail sauce on another platter or a Shrimp-Avocado Tray. A small platter of vegetables with a delicious Dill Dip is also set on the food table. Garlic bread or store (bakery) bought petite rolls is also made available. Again, later in the evening, say around 9:00-10:00 PM (after watching the crystal apple drop down the pole at Times Square on TV - 5 minutes), the food table is rebuilt with petite Almond Chicken Salad Sandwiches, a fruit platter (or a combination fruit and cheese tray, some chocolate strawberries to have with another small glass of champagne. About the time I sense people getting tired or getting ready to depart from the New Years Eve Party (or about an hour before I'm getting ready to have them depart) I bring out a tray of Chocolate Brownies and the coffee pot. This is an easy way to signal the closing of the party. When the guests have departed for home and the house is pretty much cleaned up, my husband and I sit together, holding hands and toast each other with one last glass of champagne and, as we always do, exchange letters of love and appreciation. This is a wonderful way to close the New Years Eve Party and the year and open a new one. Enjoy your New Years Eve Party and the company of those you share it with!